For music that awakens the heart and speaks of respect for our Earth home, consider the song of the Native American flute. Werner John (Flutewalker) is a master performer, flute maker and recording artist available now for your event. Classically trained, versatile, and open to inspiration of the moment, Werner offers Native flute moods from deeply meditative to light and joyous; a moving version of "Amazing Grace" on the Anasazi flute; the sweet magic of a timeless clay ocarina. 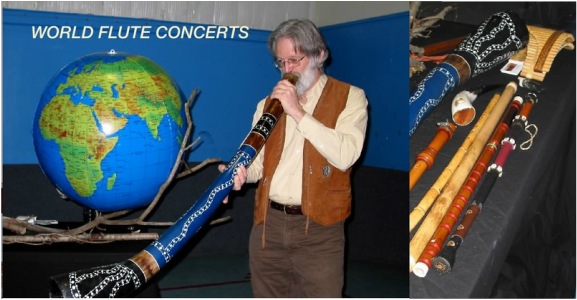 Werner John also presents full length World Flute Story Concerts (see topics below) which address cultural and environmental issues through the medium of sounds which have accompanied humanity's journey for millennia. Werner's mission is to explore connections between music, the human spirit and the natural world while bringing voices of ancient resonance to life. Werner's unique solo programs showcase simple wood, clay and bone flutes of many cultures while exploring deep connections between music... the human spirit... and the natural world. EARTH IN CONCERT Explores the healing of separation between the tribes of humanity as well as humanity and nature. Presents cutting edge concepts leading to understanding humankind as one family, and the great work of preserving together the integrity of our home planet. Includes music in European, Indigenous and integrated styles to reflect “the Condor and the Eagle flying together”. FRANCIS, A SAINT FOR OUR TIME This program explores Pope Francis' recent encyclical, "LAUDATO SI'" and its profoundly important message for our world. Flute sounds from worlds old and new reflect the deep resonance between the medieval writings of Francis of Assisi, Indigenous views of nature as Sacred, and the Pope's encyclical. THE PROMISE OF THANKSGIVING A creative musical exploration of the original historical moment. The first Thanksgiving saw two peoples of great cultural and religious difference join together in gratitude for the abundance of life. This capacity to give thanks was an integral part of their humanity, helping transcend deep differences. Can this idea help in healing our fractured world today? Features Werner's composition, "A Thanksgiving Suite" for Native flute and drum, harpsichord and cello. 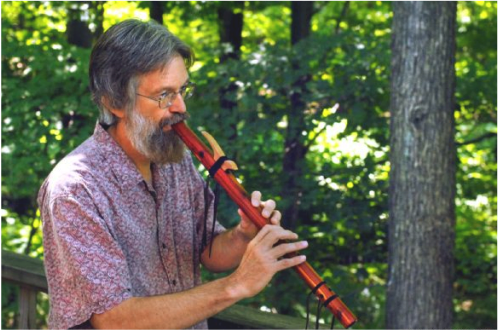 Werner John (Flutewalker) is an experienced performer who enjoys providing music for church, wedding, and memorial services, school programs, ambiance for dinner parties, and the full length Story Concert programs described above.